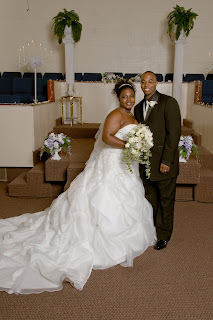 Angel and Terrence took their marriage vows in their home church that was filled with family and friends. For such a young couple, their ceremony was typical of what was done years ago. The guest list for the ceremony included the entire membership of the church. Following the ceremony, there was an open reception in the church’s dining hall. Like the ceremony, this reception was open to the entire church. Back in the day, the members of the church would host a reception following the wedding ceremony to allow everyone the chance to congratulate the newly wedded couple. They weren’t elaborate affairs, a few decorations, a cake and some punch. These were the days of the “receiving line”. The entire wedding party would line up at the entrance of the hall, with the bride and groom at the end of the line. The guests would pass down the line, meeting the members of the wedding party. The bride and groom would get to personally greet and thank everyone for coming. The high point was the cutting of the cake. The more fancy weddings included a meal, but this was not common. Angel and Terrence’s day reflected this long lost tradition while keeping up with the present. They followed the reception at the church with the currently customary private reception at the Wedgewood Banquet Center. This is a wonderfully traditional young couple with deep spiritual and family roots. I have to also say it’s been a long time since I’ve seen a couple so relaxed from the rehearsal, all the way through the reception. They had a lot of help putting it all together. Not only were Angel and Terrence having a wedding, the whole church was having a wedding. That’s how it used to be. A sign of how traditions run deep at Cosmopolitan Baptist Church, neither Cassandra or I are accustomed to being referred to by Mr. and Mrs. Not just by the youth of the church, but my many of the members. We refuse to believe it’s because we’re getting that old.